These 10" Flying Discs come in a 12 pack. This nontoxic Frisbees are designed for everyday use, which you can enjoy hours of fun! Enjoy play time with your dog & kids. Made from nontoxic heavy duty plastic. Try it, totally risk free! You have nothing to lose, click add to cart now! 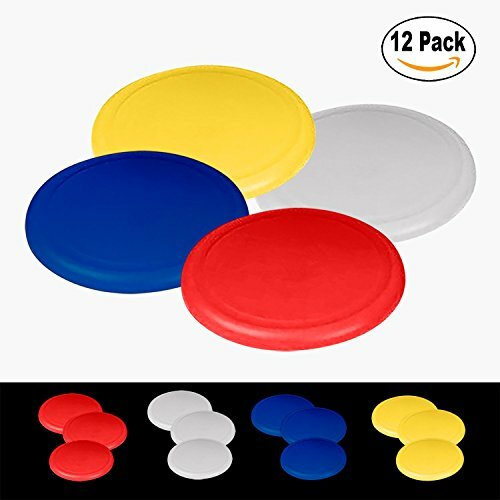 WHAT YOU GET: A Pack of 12 10" flying discs which comes in 4 different colors, 3 pieces of each color which is red, white, yellow and blue. GREAT OUTDOOR TOY - It is a great toy to play outdoors and also a lovely pet toy play with your dog a new game! HIGH QUALITY - Made from Heavy duty nontoxic plastic for long lasting experience.